Mr Ikayo from Victim Support Unit teaching children about 'Children's Rights'. 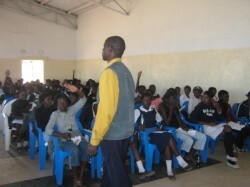 Response Network sponsorship program has recorded a 76% pass in the 2010 grade 7 primary education exams. Out of 128 girls, 98 girls have made it to grade 8 in different schools and all the girls have reported to school. We are now waiting for the grade 9 results which will be ready soon.